At Curnyn Physical Therapy we treat patients before and after surgeries such as hip/knee replacement, rotator cuff repair, repair of fractured bones, knee ligament reconstruction, and spinal surgery. 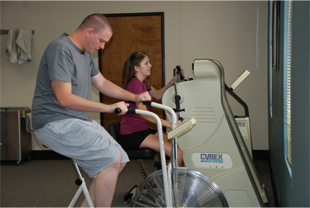 The purpose of pre- & post- operative rehabilitation is to provide a rapid recovery and optimal outcomes from surgery. Therapists maintain close communication with the physician regarding the individual treatment plan and the scope of the patient’s needs. The pre-op visit allows the patient to meet the therapist who will plan their post-operative care and ask questions about their upcoming care. This is also an opportunity for the patient to practice with post-surgery assistive devices such as walker, crutches, or cane. The therapist will explain the post-operative program and goals. Regaining movement and strength helps facilitate optimal tissue healing and recovery of functional capabilities.